I don't really like veggies all that much. I say that, but whenever I have well-prepared veggies, I love them. Usually that happens at restaurants, and sometimes in the homes of friends or family. The first time I tried brussels sprouts was at the home of my brother and his wife when they lived in England. Heidi made the Brussels sprouts as a side dish to a fantastic Christmas dinner. I honestly don't recall the main dish (sorry, Heidi), but I do remember the roasted potatoes and the Brussels sprouts. I was shocked at how delicious these tiny green cabbagy things tasted. But of course, I never made them on my own, my excuse being that my husband would never eat them. Fast forward about 13 years, and my husband and I finally tried this little restaurant in the Beaverdale neighborhood of Des Moines, Iowa. It's right down the street from us, but the name, the Flying Mango, elicited images of mango chutney and weird Latin fusion cooking. Mangos, I guess. Anyway, when we finally went there, I realized it did not involve mangoes, or chutney, or Latin food. They have a pretty interesting menu, but the only thing I've tried is the 24-hour brisket sandwich, served on a ciabatta roll (sooooo good), with a side. Their vegetables change daily, I think, and I was lucky enough to go on two days they had these Brussels sprouts. One time they had a few julienned carrots, and the last time was julienned red peppers, but I think they do that mainly for color. Since these ones were made in a hurry, I didn't embellish them with a colorful veggie. I didn't have the courage to ask them for the recipe, but what I've made here it pretty darned good. I think I need to cook them a little less time next time, but I don't even know when that will be because I think I'm the only person in the house who will eat this. Sigh. Tonight I got to share the dish you see pictured with my husband's family for our Christmas celebration. I'm sure I can scale it down for just me, and I probably will, because, contrary to popular belief, Brussels sprouts are in fact yummy. Trim the ends of the brussels sprouts, pealing off the wrinkled layers of each one. Then cut each sprout in half lengthwise. 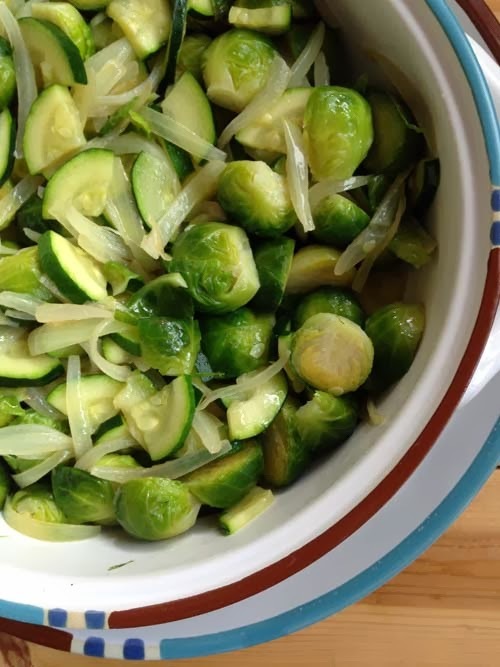 Place cut sprouts in a colander and rinse with cold water. 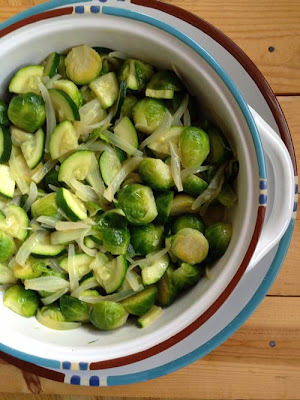 Wash and cut the zucchini, trim off the ends, quarter it, and then slice each quarter into quarter-inch slices. Set aside. Slice the half onion lengthwise into thin julienned strips. Place the sprouts in a steamer with the bottom containing salted water. Salt the sprouts lightly as well. Steam the sprouts, covered, on high heat for about 3-4 minutes, or until a sharp knife inserted meets just slight resistance. Then add the zucchini, salt again lightly, cover, and steam for another minute or two. Remove veggies from the bottom of the steamer and rinse with cold water to stop the cooking. Set aside while you cook the onions. I emptied my steamer bottom of water and put it back on medium heat. Add the canola oil and the butter. When butter is melted, add the onions and sprinkle with a little more salt. Cook onions until they are soft, but not caramelized, about 5-6 minutes. If they are browning too much, reduce the heat a little bit. When onions are soft, add the sprouts and the zucchini, stir and toss to mix all three veggies and to heat them all through. What do you do when you have a batch of extra English toffee on hand at Christmastime? You experiment with it. That's what you do. 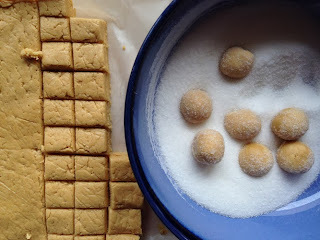 The reason I had the toffee on hand is because I'm trying to figure out how to make "al dente" toffee. That's actually the name of a toffee store in Adel, Iowa: Al Dente Toffee. My work friend, Misty, let me taste some a few weeks ago, and it was great. Sort of a light toffee, in that it was, well, al dente--not too hard, very crisp, almost airy, but not really. The recipe/method is secret, and I will continue trying to figure it out. 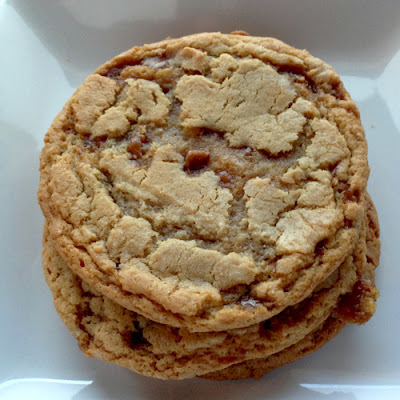 The toffee that wound up in these cookies turned out as it usually does for me--crunchy, buttery, sweet, and yummy. Perfect for this cookie application. After breaking up the toffee into chunks, I had some toffee "powder," so I subbed some of that for a 1/4 cup of the brown sugar. I think it adds to the overall richness of this cookie, which honestly is about as rich as you can get. I used my recipe for Really Chewy Chocolate Chunk Cookies, and made a couple of changes. The next day these cookies are still really chewy, really sweet, and just plain fabulous. 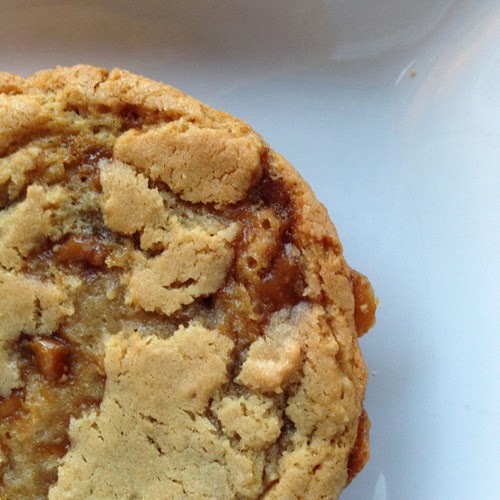 If you're into toffee cookies, you might want to try these. I'm sure you can make these a more reasonable size, just be sure to adjust the bake time. Combine flours, baking soda, baking powder, and salt in a bowl. Put dry ingredients through a sieve to sift them together. Set aside. Using a mixer fitted with paddle attachment, cream butter, cream cheese, sugars, and pulverized toffee until very light and fluffy, about 3 to 5 minutes. Add the eggs, one at a time, mixing well after each addition. Mix in the vanilla. Scrape down the sides of the bowl with a rubber spatula as needed. Reduce the mixer speed to low/stir; then add dry ingredients, and mix until just combined. Add the toffee chips/chunks, and mix briefly to incorporate. Cover dough with plastic wrap and refrigerate until cold, about two hours. Preheat oven to 350°F. Remove the bowl of dough from the refrigerator, and allow it to soften slightly. Line a baking sheet with parchment paper or a nonstick baking mat. Now here is where you have to decide what size to make the cookies. I used a large sized Pampered Chef cookie scoop, which is probably about a quarter cup. Bigger is probably better with these cookies. 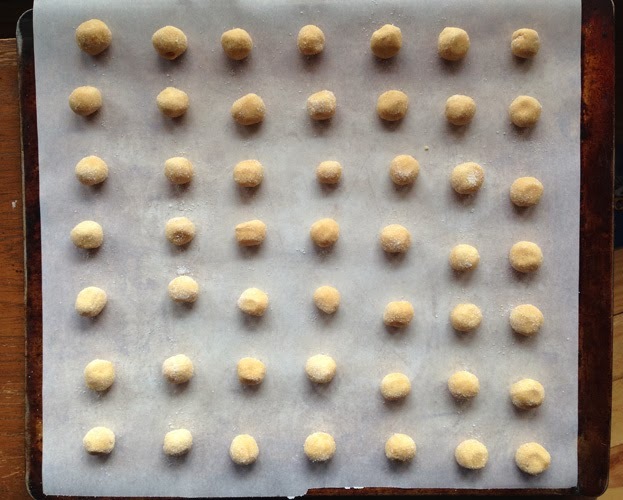 Place scoops onto parchment-lined cookie sheets and leave about 2 to 3 inches between cookies. Bake cookies for 14-16 minutes or until puffed and browned at the edges. Transfer the baking sheet to a wire rack for 10 minutes, then transfer the cookies onto the rack to cool a bit more. 1. Line a square Pyrex pan (8X8) with parchment paper or non-stick foil. 2. In a heavy saucepan heat butter and sugar to boiling over medium heat, stirring constantly. Boil over medium heat until it reaches 300° on a candy thermometer. Pour into prepared pan and evenly spread with a silicone (not rubber) spatula. Allow to cool completely. 3. Break toffee up into big chunks with your hands and then on a clean cutting board, chop into smaller bits. Be sure to taste some to see if it's good. Makes about 1 1/2 cups of toffee bits. Use the extra to make some toffee chocolate chip cookies or use as an ice cream topping. They'll keep in a zip top bag for a few weeks as long as you keep them in a cool, dry place. Winter means poor lighting and inferior pics. So, my Chile Colorado Burritos remain the most viewed and most-pinned recipe I have here on this blog. The funny thing is, that I tried to get that pic onto Foodgawker.com, but it was rejected--I think because of its "composition." I'm no photographer, but I thought it was a decent pic. 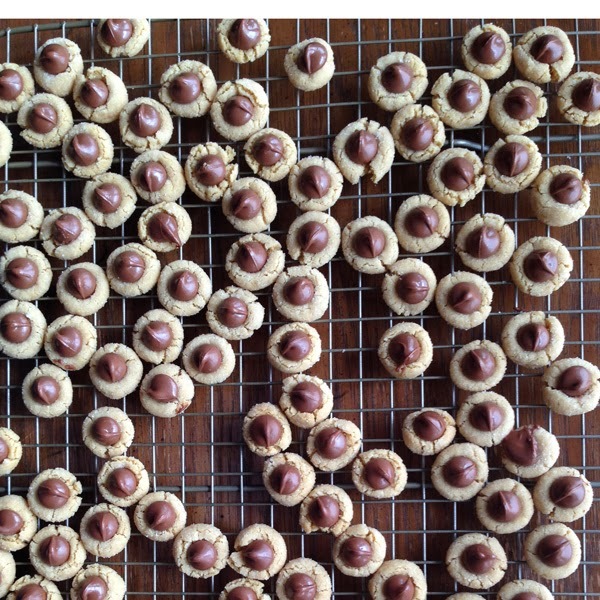 Anyway, thank you, Pinterest for making that recipe, and my blog, so popular. It enriches my life to know I've helped a few people make an easy, delicious dinner. Now, if you happen to have made too much Chile Colorado meat, and you have some sitting in the fridge, you need to try this recipe for the leftovers. I thought that the Chile Colorado Quesadilla was tasty, but this is much better, in my opinion--and it's gluten free. Some people in my house do better with gluten free. My whole family loved this, so it's definitely going to be on our menu again. I tend to like it when my tortilla chips get a little soft and saucy. I enjoy the mixture of crispy parts and soft parts of a chip prepared with a saucy meat. 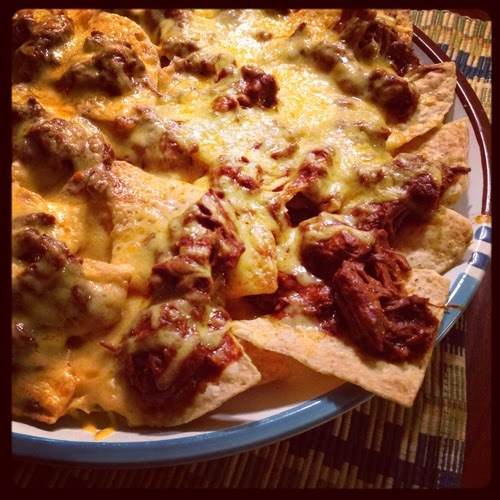 If you do not like that, and you want to have mainly crispy nachos, then either reduce or omit the additional enchilada sauce. In a medium saucepan, heat the leftover Chile Colorado meat with the enchilada sauce. Use two forks to break the meat up and shred it. Turn your oven broiler on. 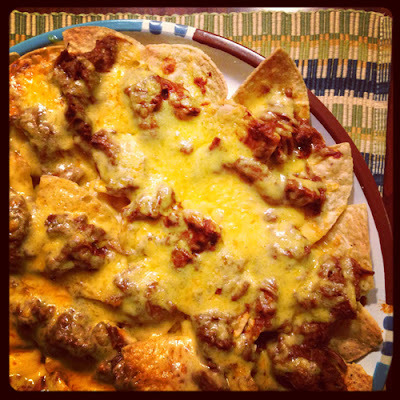 Spread tortilla chips evenly over a baking sheet lined with foil or over an oven-proof serving dish. When the meat is hot and shredded, try to evenly plop it over the chips here and there. Cover the chips and meat evenly with the cheese. Broil for 3-5 minutes or until cheese is completely melted and starting to bubble. Serve hot, but be careful. I'm not sure what made me think of these, but I think it was my recent discovery that I could refrigerate cookie dough in a pan and cut it into chunks to bake, instead of scooping with a cookie scoop (see Crisp Mini Chocolate Chip Cookies Made Easy). When thinking about the chips, I remembered that Ghirardelli makes relatively large chocolate baking chips, so their milk chocolate version seemed perfect for this application. And they ARE. Absolutely perfect. I was a little concerned that the cookies would get too crisp because they are so small, but a 5-minute bake time got the job done without any over baking. 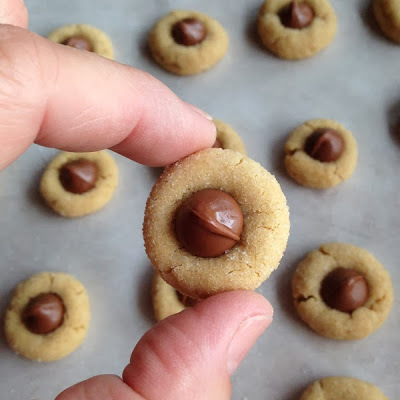 These are a perfect bite-size cookie that make me happy. Sure, they take a little more time than regular size cookies, but they are so worth it. Now I just need to figure out who to give these to before I eat them all. Prepare a metal brownie pan (I used a 7 cm x 11 cm pan) by lining it with parchment or wax paper. Set aside. In a large mixing bowl, cream the butter, peanut butter, and the sugars until fluffy. Add the egg, milk, and vanilla and beat until thoroughly mixed. Add the flour, baking soda, and salt and mix on low until combined. Do not overmix. Transfer the dough to the paper-lined brownie pan and smooth it out until you have an even layer. Place plastic wrap on top and then gently pack the dough in and leave the plastic wrap on top of the dough. Place in the refrigerator for at least 2 hours to chill. 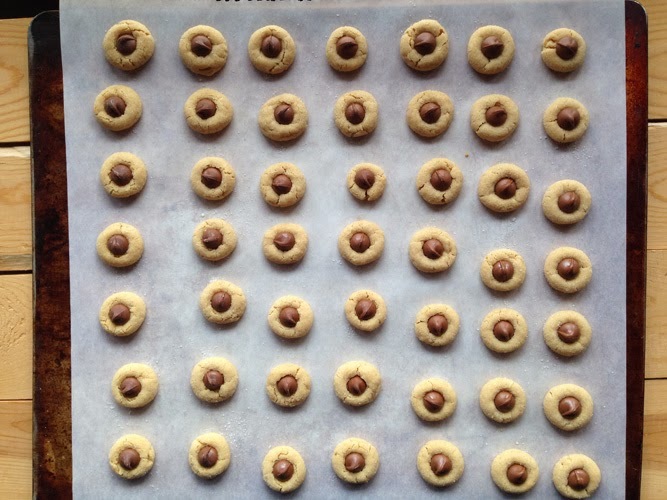 Preheat the oven to 375 degrees Fahrenheit about a half hour before you plan to form the little cookies. 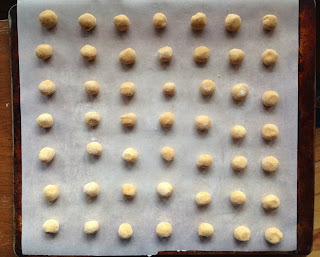 Then line a cookie sheet with parchment paper and place about 1/3 cup granulated sugar in a bowl that you will use to coat dough balls with sugar. Once dough is thoroughly chilled, remove from the refrigerator. Lift the dough out by using the edges of the paper. Cut the dough into about 1 cubic centimeter pieces, so that you end up with about a half teaspoon of dough. Roll each cube into a ball, roll in sugar, and place on the prepared baking sheet. Leave about 1 1/2 inches between dough balls. Once the pan is filled, return the remaining dough to the refrigerator and then bake cookies for about 5 minutes at 375 degrees, or until they are puffed and slightly cracked. 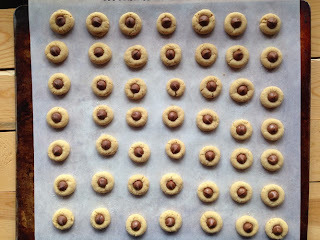 Remove from oven and immediately top each cookie with a milk chocolate chip, pressing down to secure the chip. You need to move quickly because you have a lot of cookies and they start to cool pretty quickly. 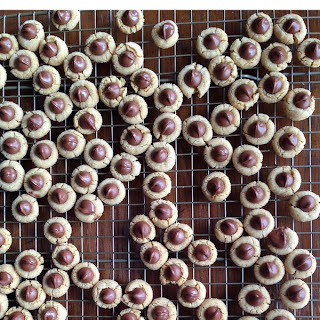 Move cookies to a wire rack to finish cooling. Wait until the chocolate has solidified again before storing or serving.